We probably all remember the 2016 Olympic moment when Michael Phelps debut his deep-purple dots from the healing practice of cupping therapy. Physiologically, cupping is thought to draw blood to the affected area, reducing soreness and speeding healing of overworked muscles. This is achieved when the suction causes the capillaries to rupture just beneath the surface of the skin, which not only produces the circular, eye-catching bruises, but also creating local inflammation, triggering the immune system to produce cytokines, thereby, enhancing the communication between cells and helping to modulate the immune response. Cupping has become one of the most popular recovery modality embraced by athletes worldwide as we observe the eye-catching purple dots that have been so visible on Phelps and Hollywood celebrities such as Jennifer Aniston and Gwyneth Paltrow. 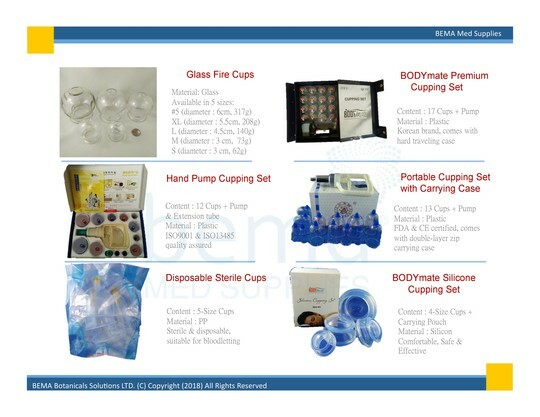 To bring the Cupping healing experience to your practice, Bema Med Supplies department carries a variety of cupping equipment, ranging from the traditional glass fire cups, to the modern shock and heat resistant plastic cups. There are also silicon cups and sterile disposable polypropylene cups available, handy for those occasion when bloodletting is necessary to remove stasis. If there are any questions regarding our products, please feel free to inquire by email or phone.